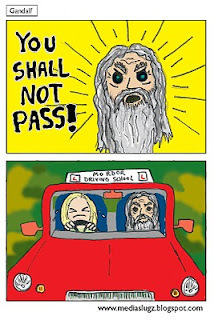 The thing you might not know about Gandalf the Grey from Lord of the Rings, is that he dabbled for a while as a driving instructor. You can see why he chose to realign his career down the path of wizardry. Not a great pass to fail ratio. In fact he was so terrible at it that he was banned from driving and has been forced into traveling by horse and cart as well as giant bird. I drew this comic shortly after my sister Laura failed her driving test. So roughly 3 months ago, in which time she has retaken her test and passed so what I’m trying to say here is that my comics are nothing if not irrelevant.